This tractor is equipped with the optional cyclone air precleaner. Also note the knob on the lower right side of the dash which shifts the Sherman overdrive transmission. Sherman transmissions were offered as a dealer installed option and were available in overdrive (Step-up), underdrive (Step-down) and dual range over/underdrive models. 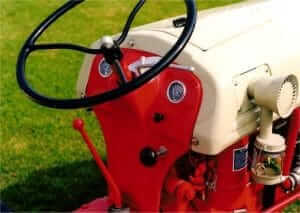 Most singles had a shifter lever on the left side of the transmission, but some were offered with a cable shifter for a short time. Since the cables rusted and froze up easily, they were soon dropped from the Sherman options.